A custom look straight from the factory. This is the ultimate custom cruiser. 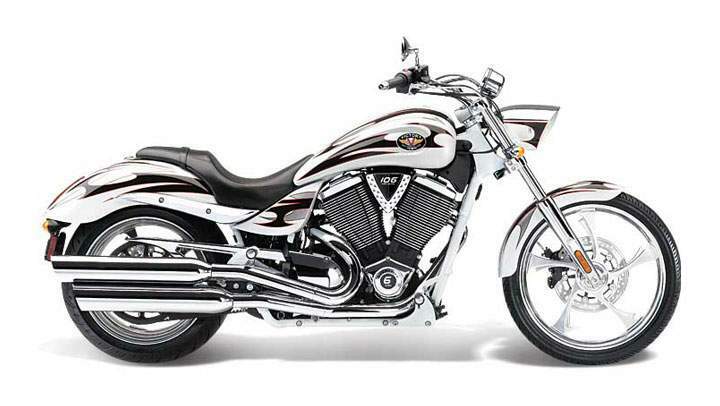 The Vegas Jackpot exudes style from its billet wheels to the color-matched frame and chrome front end. 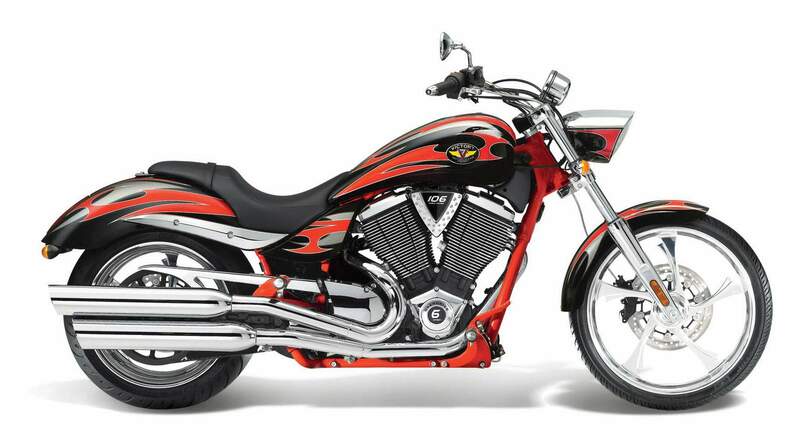 It's long, low, sleek and powerful, with a meaty rear tire that complements the bike's unique style. 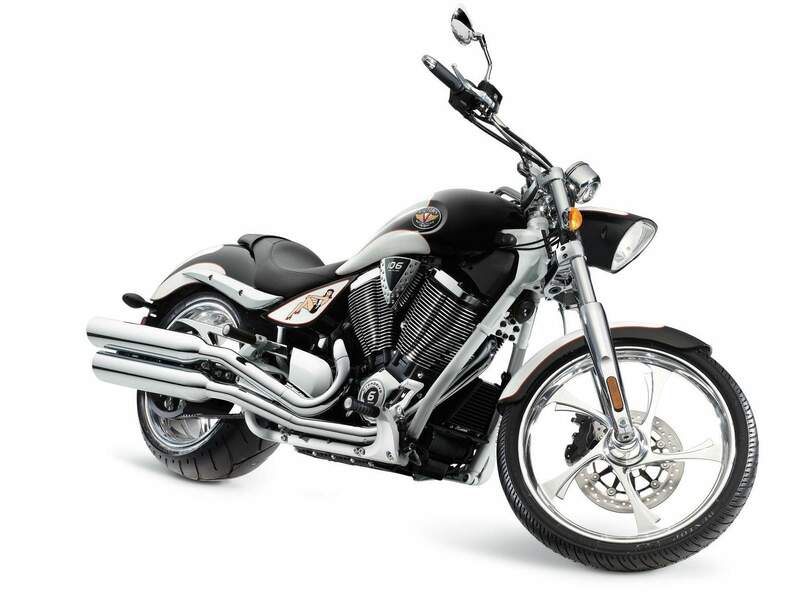 The first cruiser motorcycle to blur the lines between custom and stock is back in 2012, with another year of polished chrome, primal graphics, unparalleled power and uninhibited style. 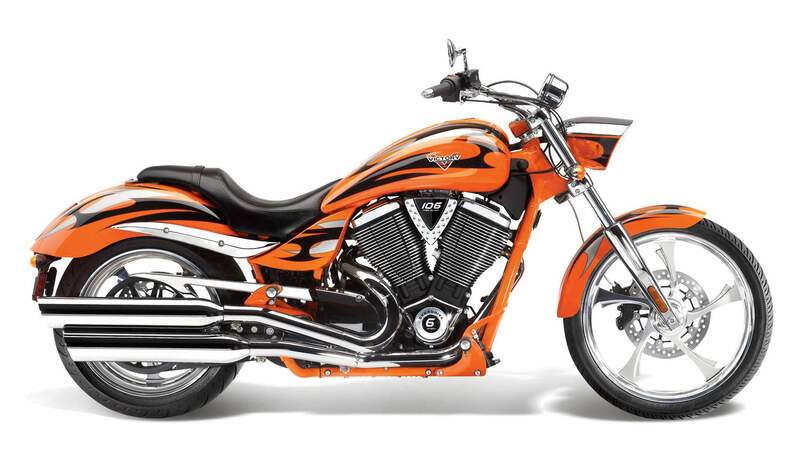 The Vegas Jackpot custom cruiser motorcycle powers down the city streets with an all-new Freedom 106 V-Twin that brings 10% more displacement to your ride this year. The distinctive styling of the Jackpot custom cruiser guarantees that people will be asking - "Where did you get that done?" whenever you take a break from the pavement crushing performance to fuel up. Available in three distinctive color schemes - Pearl white and black with graphics, Black and Indy Red with graphics, or intimidating Solid Black - you're definitely going to stand out in the crowd with this machine. With this combination of power, performance, comfort and style, there is only one question that remains - why aren't you riding a Vegas Jackpot yet? Follow your passion to ride with a custom cruiser motorcycle that begs to be driven - try the Vegas Jackpot at a local motorcycle dealer today. o The triple clamp is black on all models except the Vegas Jackpot Jackpot (which retains its chrome triple), and the Victory Cross Roads (which retains its brushed finish). o Distinctive Vegas-family raised spine runs the length of the bike on the fenders and fuel tank. o "Anvil" billet wheels, including 21-inch front wheel. o Chrome front end (forks and triples). o Colour-matched frame and two-tone headlight housing. o New 6-speed transmission with overdrive. o New X-Bow and Tri-Pro Stage 1 Performance Exhausts. o Large selection grips, lower controls, covers and trim in varied finishes and designs. o New speedometer features blue backlighting, indicator lights on the gauge face and large LCD that provides: Clock (viewable at all times), gear position, tachometer, odometer, trip meter and diagnostic readouts. The best performing transmission on the street collects the power generated by the massive V-twin and allows the Vegas Jackpot to roll fluidly between the curbs. Helical-cut gears ensure that each shift will be as smooth and clean as the bike itself. Put a 250 mm tire on the back of a street cruiser like the Vegas Jackpot, and rider and machine both look like they are ready for anything the road has to dish out. In this case, looks aren't deceiving. This tire will stick to the road no matter the condition, and make any rim proud to be associated with it. As in poker, the Vegas Jackpot always leads with trump. At the head of Jackpot's 106 cubic-inch charge rolls a wheel that's as artful as the bike itself, priming the eye for the added treat to follow. Strong as an anvil, it can easily bend any road to its will. After witnessing the eye-popping custom inspired paint and detailed color-matched frame and headlight, it would seem no surprise if a custom shop paint shooter sauntered up and said 'That's my custom'.